Summary of today’s show: Fr. Joseph Scorzello has been a priest-secretary for two cardinals, a parochial vicar, a pastor, and now a seminary professor. 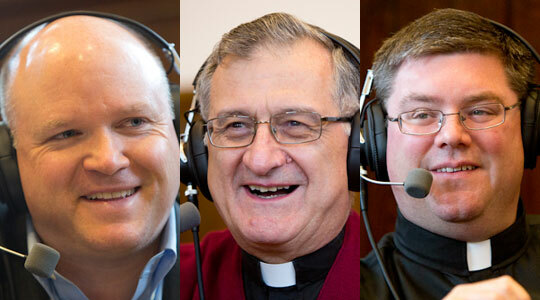 He joins Scot Landry and Fr. Chris O’Connor to talk about attending seminary in Rome just after the Second Vatican Council closed; serving in several of Boston’s Italian parishes; being asked to become a priest-secretary by Cardinal Humberto Medeiros and his successor, Cardinal Bernard Law; and ultimately ending up at St. John’s Seminary where he teaches philosophy and imparts his decades of pastoral experience upon the young men who will follow him into the priesthood. 1st segment: Scot Landry welcomed Fr. Chris O’Connor back to the show and notes that they are recording today at St. John Seminary. He noted that the seminary is called the heart of the Church and asked Fr. Chris what that means. Fr. Chris said this place and its purpose serves as the lifeblood of any diocese. As Cardinal Seán has said, without priests, there is no Eucharist and the Eucharist is at the heart of our Catholic existence. The seminary provides priests and those who will minister throughout the Archdiocese. While the principal purpose is to form priests, they also offer all sorts of programs to the laity as well, in order to shape and form them to be co-workers with the priests. The parish is only as good as the pastor who empowers the people around him to assist him in running the parish and in evangelization. Evangelization is a big part of our agenda. It involves every man, woman, and child in a parish so they offer programs to educate the laity in such a way that they know him in a deep and profound way and transmit that to others. Scot said The Theological Institute for the New Evangelization and St. John Seminary are able to do this work because of the great work of the faculty, including Fr. Joseph Scorzello. He asked Fr. Chris to tell listeners about Fr. Scorzello. Fr. Chris described Fr. Joe as a great mentor to him. He said he’s a man of deep prayer and is always present in the seminary and values the work of seminary formation. He said when bishops from others dioceses ask why they should send their seminarians to St. John’s, Fr. Chris notes it’s a regional seminary forming men from around New England and building those relationships among the priests and it has a great faculty, who are all united on the right stuff and who value and treasure the priesthood. 2nd segment: Scot and Fr. Chris welcomed Fr. Joseph Scorzello. Scot said Fr. Joe has had an interesting priestly life. He asked him about his background. Fr. Joe said he was born and lived for 10 years in East Boston and attended Most Holy Redeemer Church. They moved to Hyde Park and went to Most Precious Blood Parish and attended St. Raphael’s school. From there he went to Christopher Coilumbus High School in the North End and graduated from there in 1962 and entered Cardinal O’Connell college seminary in Jamaica Plain. After two years there, he came to St. John Seminary and studied Philosophy at St. Clement’s Hall. After two years there, he received a bachelor’s degree and was appointed by Cardinal Cushing to theological studies at the North American College in Rome and the Gregorian University. He was there for four years until 1970 and was ordained in Rome on December 19, 1969. They were ordained at the end of the first semester of the fourth year of theology which was unusual, but which was allowed for seminarians at the Gregorian University. He was ordained by Bishop Hickey, who became the cardinal archbishop of Washington, DC. Scot asked what it was like to be studying in Rome during Vatican II. He said it was exciting academically speaking. Many of the faculty were members of the commissions that put together the draft documents for the Council. Fr. Joe said it was all part of the course material he was studying. They would refer to the documents in their courses on Scripture and fundamental theology and more. He was there just a couple of years after the close of the council. Bishops came to visit who were members of the council. In 1968, Pope Paul VI wrote the important encyclical Humanae Vitae. Scot asked about the change in the liturgy and whether Fr. Joe was trained in both the old and new rites. Fr. Joe said at his ordination they had the new English translation of the Mass in a binder on the altar because it was so new. He also offered Mass in Italian. His first Christmas Eve Mass was in Italian with the workers at the North American College. Fr. Chris said there are two basic systems for seminary formation, the French system and the Italian system. St. John’s follows the French system, having been founded by the Sulpician order, where the faculty live with the men. Fr. Joe explained the Italian system, in which the college is a living space. At the NAC, all the Americans from all over the states would live together, eat together, pray together, and do some formation together. Their intellectual formation was done at a university. Most went to the Gregorian University, but there were others as well, including the Angelicum. after ordination, during the second semester, the new priests celebrated Mass at the college, and during Lent they went out to the hospitals in Rome to hear confessions. Next to the college is a hospital for children, where the sickest children are sent. Many of them die there. He would go over to pray with the family at the death of their children. He never wanted to hear the phone ring. Scot asked whether the change in the liturgy was controversial among the seminarians or were they in favor of the change to vernacular. Fr. Joe said most of the men were happy to see the vernacular, but there was tension as well and its true in himself. It’s difficult to leave what you were brought up with and familiar with. Now there was a new way of doing something. His concern, even now with teaching the Tridentine rite, we have to celebrate the Eucharist and it has to be prayerful. If we’re doing it in a language we’re not familiar with, it may not be as prayerful as it could be, especially as the priest-celebrant leading it. As the president of the assembly, the priest has to lead the assembly in prayer. He said some of the men in his class didn’t have as much Latin as others and were happy to go into the vernacular. Certainly Gregorian chant was irreplaceable. Overall, everyone was happy with the change, if perhaps not as happy with all the translations. He said the new translation is a bit more reverent and using a language that is a bit different from regular day-to-day language so it lends itself to a prayerful environment. Scot noted that it often takes several generations after a Council for the Church to appropriate all aspects of it. Fr. Joe said he returned home to Boston in July 1970 and celebrated his first Mass here on July 19. His first assignment was St. Mary’s Italian Church in Salem, which had a small Italian community. The monsignor who was there was a wonderful first pastor. He was very respectful of Fr. Joe. At one point, he was in charge of religious education and when concerns came up about the textbook, he accepted Fr. Joe’s decisions on the matter. He was prayerful and concerned about his people as well. He was then assigned to Our Lady Help of Christians in Newton. They also had a large Italian community there. There were four priests there at the time. They had a grammar school and a high school, where he taught for a year. He also visited the grammar school often as well. He also taught religious education. He celebrated funerals and weddings in Italian and heard confessions in Italian and had Communion calls in Italian, about 20 or 30 per month. He was also on call at the hospital for the occasional Italian patient who didn’t speak English well. After eight years he moved again to St. Anthony’s in Revere, another strongly Italian parish. St. Anthony’s had four priests as well. This was about 10 or 11 years in the priesthood for Fr. Joe so he was the senior curate in the house, that is the most senior of the priests not the pastor. Fr. Joe was put in charge of the parish band even though he’s neither a musician or singer. He was there for about 2–1/2 years and one day got a call from Bishop Thomas Daily who asked him to come in. Cardinal Medeiros wanted him to come in and meet on Friday. The whole week from Monday to Friday he wondered what it was about. On Friday, the cardinal told him he wanted to appoint him as his secretary. Fr. Scorzello thought it was a mistake at first, but the cardinal insisted that it would be a good fit. The Cardinal asked if he needed time to think about it, but Fr. Joe said that if it was the wish of the archbishop then he didn’t have to think about it. He was asked not to talk about it until he got the official appointment, except for his pastor. The next week, Fr. Joe got a call from the cardinal himself who told him to call his parents and tell them first. Scot said he can’t recall any personal memories of Cardinal Medeiros. Fr. Joe said he’s known many priests and bishops and says from his own judgment that he was a bishop who was holy, intelligent, and perceptive. He had them to a higher degree than anyone else he’s known. He knew the diocese well, he loved the people and priests, he was intellectually acute. At the time, Fr. Joe was studying for his comprehensive exams in philosophy, and the cardinal was hospitalized for a week and every night the cardinal quizzed him on the work. Scot asked what the cardinal’s legacy is in the Archdiocese. Fr. Joe said he stabilized the archdiocese’s finances certainly, but his legacy is really his gentleness, his love of his priests, and the lasting memory of him among the people. He said the funeral Mass for the Cardinal was incredible. They celebrated memorial Masses for him all week and the cathedral was filled for all of those Masses. Fr. Chris said one of his earliest memories is of standing in the huge line at the cathedral for the wake. The line went out the cathedral doors and they had to wait more than an hour and a half to go by. He remembers the reverence and love and outpouring of the people. Bishop Daily was appointed administrator and then out of the blue a bishop from Missouri was being sent to Boston. Fr. Joe said Bishop Bernard Law was named in January 1984 and came up for the news conference and met with the auxiliary bishops of Boston, the secretaries, and the bishops of the metropolitan region. He asked Fr. Joe to return to Springfield-Cape Girardeau to help him transition to Boston. He stayed there for six weeks. Fr. Chris noted it was only supposed to be 10 days originally. When he was told he needed to stay for six weeks, Fr. Joe told Bishop Law that he’d have to make a few phone calls, to Bishop Daily, of course, but more importantly to his mother so she wouldn’t worry. Fr. Joe said his mother was delighted to hear from him. Much later, after Cardinal Law had retired to Rome, after the death of Fr. Joe’s sister, he called Fr. Joe’s mother to extend his own sympathies to her. Scot said he has heard from many, many people about Cardinal Law that when somebody was ill or in the hospital or somebody had died that was close to one of his priests or to somebody that worked in the chancery, that the cardinal was tremendous in those moments. Scot said that for the archbishop, there is so much administration and so much ceremony that there isn’t a lot of time for simple pastoral ministry of a priest. Fr. Joe said while he was with the cardinal as his secretary,one time as they traveled from Worcester, the cardinal wanted to go to Ipswich because there was a nun there who was dying that he wanted to visit. It was already after 8pm and the house was secluded and once they were there the cardinal gave the anointing and visited for a while and they didn’t get home until after 11pm. The Cardinal came to Fr. Joe’s dad’s wake and funeral too. He continued the tradition set by Cardinal Medeiros. They both had a great deal of affection for the priests and the people. After his time as priest-secretary, Cardinal Law asked him to become administrator of Most Precious Blood in Hyde Park. Bishop Riley was the pastor there and was getting on in years so he had very much on his plate as auxiliary bishop and pastor of parish and school. This was after the cardinal’s first year in Boston. It worked out for Fr. Joe very well to go back to his home parish. While Fr. Joe was there was when his own father got sick and died so it was a blessing to be close to home. After 5–1/2 years, he asked not to become pastor and asked for sabbatical for six months to write his dissertation. He went up to St. Anselms College abbey to live with the monks and wrote a rough draft of his dissertation. After that he was assigned to St. Mary’s in Brookline with Fr. Jack Ahern and Fr. Richard Lennon, now the bishop of Cleveland, and Fr. Joseph Trainor, He taught school there again and religious education. He continued working on his doctoral dissertation and celebrated his 25th anniversary of his priesthood while there. He took his mother and sister to Rome to celebrate. They visited with friends in the city every night and had a wonderful time. Cardinal Law got them very good audience tickets to greet Pope John Paul II. The Friday of the week, December 17, he got a call from the Vatican inviting them to celebrate Mass in the private chapel with Pope John Paul on the following morning. They went to the early Mass with the Pope and met him afterward. He was at St. Mary’s for another after that and then he was appointed Pastor of St. Francis of Assisi in Medford. Scot noted that you can see it from Route 93. After six years there, Fr. Joe was asked whether he wanted to stay or apply to another position. He wasn’t happy with all the administrative work of the pastor so he asked to be made a parochial vicar. The cardinal asked him to come in and talk about it. The cardinal said he would respect his decision given that Fr. Joe had always been obedient and said yes to the bishop’s requests. So he appointed him as parochial vicar at Our Lady of Lourdes in Brockton. after a couple of years, he got a call from Fr. John Farren, a Dominican priest he didn’t know. Fr. Farren asked Fr. Joe to come and teach at the seminary. Fr. Joe said the first year, he came from Brockton twice per week to teach, which was a bit difficult. At the end of the year, he said he couldn’t keep it up any longer at 60 years old doing two jobs. Fr. Joe asked Cardinal Seán to appoint him full-time to the seminary or to the parish. That was 7 years ago. Fr. joe said the great gift of working at the seminary is the priestly fraternity with the faculty. Most priests live alone in their rectories or with one other priest, but in the seminary there are many more priests. Then the young men in the seminary are very courageous and inspiring to dedicate themselves to Christ and His Church. Fr. Joe said he’s always enjoyed being a priest, but the seminary is a very special assignment. Scot said it’s unusual for a priest serving many years in parishes to come onto the seminary faculty as a professor late in life. Fr. Joe said that was one of the reasons Fr. Farren asked him to come to the seminary. He wanted him because of his pastoral experience. Most of the priest-faculty have only spent a limited amount of time in the parish, so in classes and at meals, the students are intent on talking about his pastoral experiences. Fr. Chris said Fr. Joe really shines in those lunches in which he imparts his wisdom in both the good and bad, the dangers and what to look out for and watch for as a priest.